In anticipation of publication of CRIES OF LONDON, it is my pleasure to present this extract from the book. 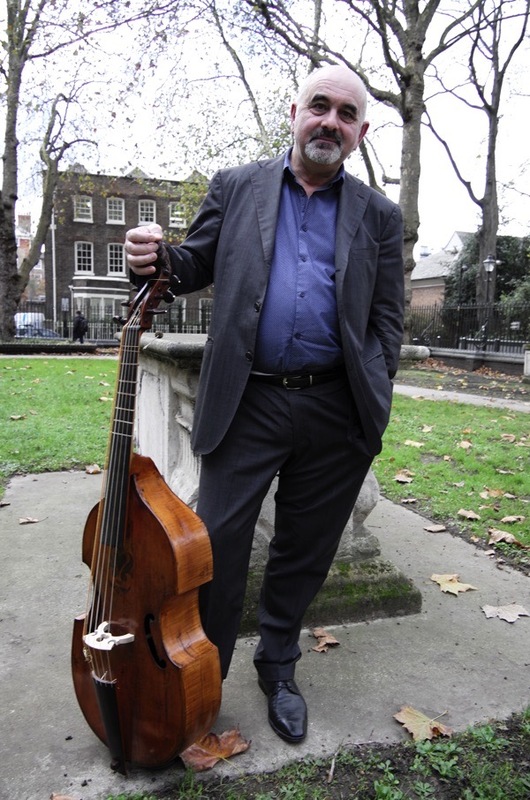 I hope you can join me for the LAUNCH next Thursday at Waterstones Piccadilly or the CONCERT next Friday at Shoreditch Church or the PEDLARS CONFERENCE next Saturday at Bishopsgate Insitute. We shall be giving away posters of this drawing by George Scharf of London boardmen & women in the eighteen-thirties to all at these events. The dispossessed and those with no other income were always able to cry their wares for sale in London. By turning their presence into performance with their Cries, they claimed the streets as their theatre – winning the lasting affections of generations of Londoners and embodying the soul of the city in the popular imagination. Thus, through time, the culture of the capital’s street Cries became integral to the distinctive identity of London. Undertaking interviews with stallholders in Spitalfields, Brick Lane, Columbia Road and other East End markets in recent years led me to consider the cultural legacy of urban street trading. While this phenomenon might appear transitory and fleeting, I discovered a venerable tradition in the Cries of London. 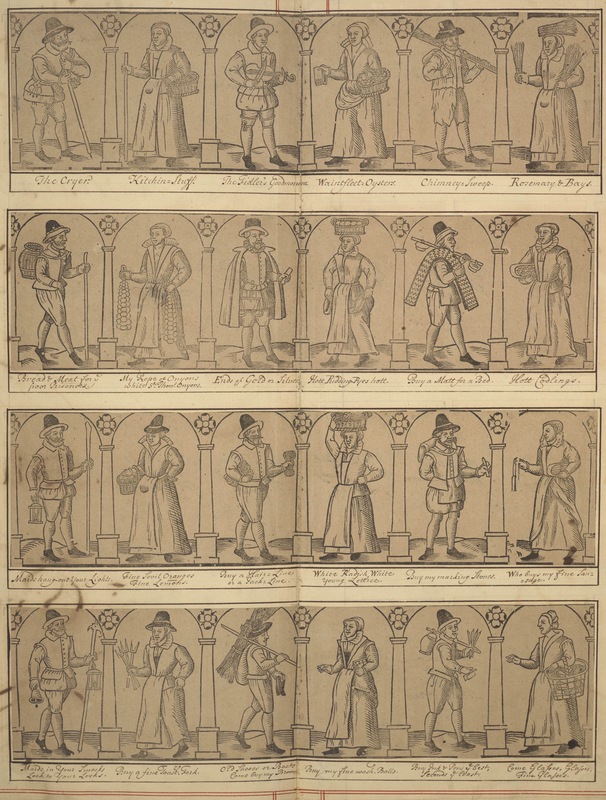 Yet even this genre of popular illustrated prints, which began in the seventeenth century, was itself preceded by verse such as London Lackpenny attributed to the fifteenth century poet John Lydgate that drew upon an earlier oral culture of hawkers’ Cries. From medieval times, the great number of Cries in London became recognised by travellers throughout Europe as indicative of the infinite variety of life in the British capital. Given the former ubiquity of the Cries of London, the sophistication of many of the images, their significance as social history, and their existence as almost the only portraits of working people in London through four centuries, it astonishes me that there has been little attention paid to this subject and so I have set out to reclaim this devalued cultural tradition. I take my cue from Samuel Pepys who pasted three sets of Cries into his albums of London & Westminster in a chronological sequence spanning a century, thereby permitting an assessment of the evolution of the style of the prints as well as social change in the capital in his era. In my book, I have supplemented these with another dozen series published over the following centuries which trace the development of the Cries right into our own time. My policy has been to collate a personal selection of those that delight me, those that speak most eloquently of the life of the street and those created by artists who demonstrated an affinity with the Criers. Through the narrow urban thoroughfares and byways, hawkers announced their wares by calling out a repeated phrase that grew familiar to their customers, who learned to recognise the Cries of those from whom they bought regularly. By nature of repetition, these Cries acquired a musical quality as hawkers improvised upon the sounds of the words, evolving phrases into songs. Commonly, Cries also became unintelligible to those who did not already know what was being sold. Sometimes the outcome was melodic and lyrical, drawing the appreciation of bystanders, and at other times discordant and raucous as hawkers strained their voices to be heard across the longest distance. Over time, certain Cries became widely adopted, and it is in written accounts and songbooks that we find the earliest records. 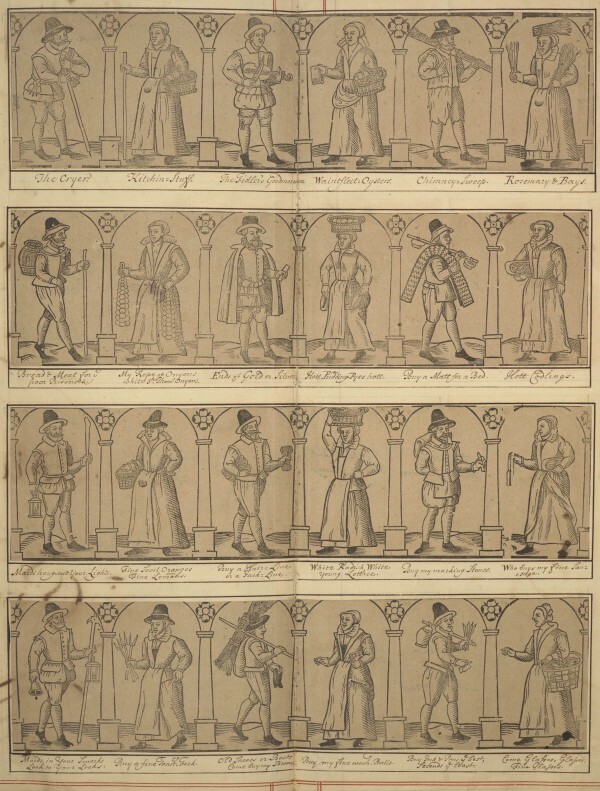 Print collections of pictures of Criers also became known as ‘Cries’ and although the oldest set in London dates from around 1600, there are those from Paris which predate these by a century. Characteristically, the Cries represented peripatetic street traders or pedlars, yet other street characters were also included from the start. 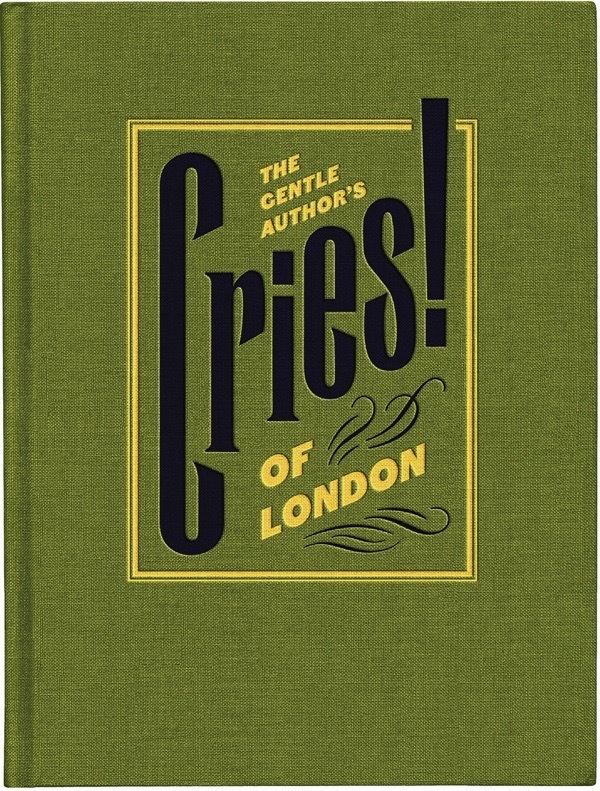 At first, the Cries were supplemented by the bellman and the town crier, but then preachers, beggars, musicians, performers were added as the notion of the Cries of London became expanded by artists and print sellers seeking greater novelty through elaborating upon the original premise. Before the age of traffic, the streets of London offered a common public space for all manner of activity, trading, commerce, sport, entertainment and political rallies. Yet this arena of possibility, which is the primary source of the capital’s cultural vitality has also invited the consistent attention of those who seek policing and social control upon the premise of protecting citizens from each other, guarding against crime and preventing civil unrest. 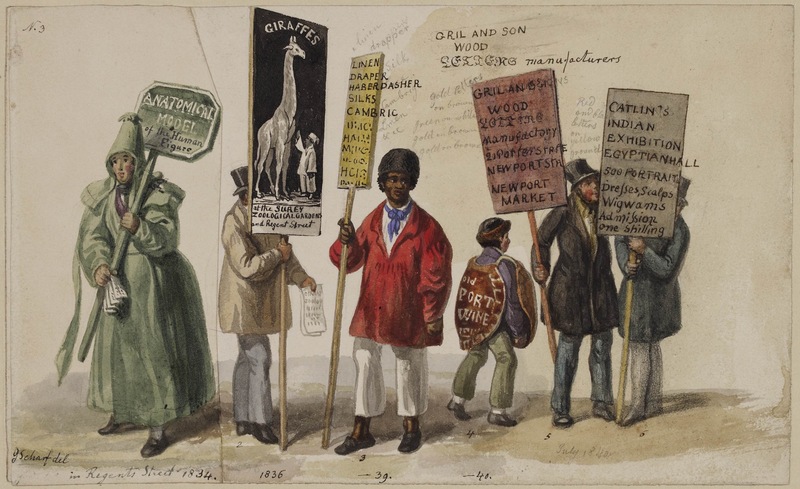 It suits the interest of those who would rule the city that, in London, street traders have always been perceived as equivocal characters with an identity barely distinguished from vagrants. Thus the suspicion that their itinerant nature facilitated thieving and illicit dealing, or that women might be selling their bodies as as well as their legitimate wares has never been dispelled. Like the internet, the notion of the street as a space where people may communicate and do business freely can be profoundly threatening to some. It is a tension institutionalised in this country through the issuing of licences to traders, criminalising those denied such official endorsement, while on the continent of Europe the right to sell in the street is automatically granted to every citizen. Depending upon your point of view, the itinerants are those who bring life to the city through their occupation of its streets or they are outcasts who have no place in a developed modern urban environment. When I interviewed Tony Purser on his last afternoon after fifty-two years selling flowers outside Fenchurch Street Station in the City of London, he admitted to me that as a boy he assisted his father Alfie, and, before licences were granted in 1962, they were both regularly arrested. Their stock was confiscated, they were charged three shillings and spent the night in the cells at Bishopsgate Police Station, before going back to trade again next day. I was told that in Brick Lane, until recently, it was possible for casual traders to buy five pounds’ worth of parking tickets from a machine as a day’s licence but, when this was withdrawn those who had always sold their possessions on the pavement on Sunday mornings found themselves on the wrong side of the regulations. Prior to the opening of a shopping mall of sea containers for international brands on the former Bishopsgate Goods Yard, I witnessed fly-pitchers in their eighties and nineties turfed off the pavement by dubious enforcement officers who pilfered the best of their wares. Yet in this part of London, the heartland of markets and street trading, there is a long-held understanding, that those who have no job, no shop, or stall have always been able to sell things in the street and make a living for themselves. I know several people who spend their days searching dustbins in the East End and make a living by selling their finds on Brick Lane each Sunday, and students who sell off their clothes and textbooks each week to buy groceries. I met a man who sold baked potatoes outside the Tower of London and opened a restaurant that became a chain. I know a spoon carver who sat on the pavement carving spoons until he saved the deposit to rent a shop. Last year, I interviewed a recently-divorced electrician who had his tools taken away and became a Directions Man, making an income by standing outside Liverpool Street Station and showing visitors the way. Street trading proposes an interpretation of the ancient myth of London as a city paved with gold that is not without truth. Many large British corporate retailers including Tesco, started by Jack Cohen in 1919, Marks & Spencer, started by Michael Marks in 1884, owe their origin to single stalls in markets – emphasising the value of street trading to wider economic development. Meanwhile, Oxford Street Association seeks to rid the pavement of souvenir sellers between the large department stores and the current trend towards the privatisation of public spaces sees the increasing introduction of bylaws restricting trading solely to those legitimised by the property owners. In particular, it was the story of Tony Hawkins, a licensed pedlar who was arrested eighty-seven times for legally selling caramelised peanuts in the West End of London that inspired me to pursue the history and politics of London street trading. Tony told me that on each occasion he was beaten up and had his stock confiscated even though he had the right to trade under the Pedlars Act of 1871. I recognise his experience as a snapshot of the contemporary situation for hawkers and also as testimony to the ongoing struggle of street traders, who have been consistently marginalised by the authorities in London through the centuries yet managed to thrive and endure regardless, through heroic tenacity and strength of will. In the twentieth century, the Cries of London found their way onto cigarette cards, chocolate boxes, biscuit tins, tea towels, silk scarves, dinner services and, famously, tins of Yardley talcum powder from 1912 onwards, becoming divorced from the reality they once represented as time went by, copied and recopied by different artists. Yet the sentimentally cheerful tones applied by hand to prints that were contrived to appeal to the casual purchaser, chime with the resilience required by traders selling in the street. And it is our respect for their spirit and resourcefulness which may account for the long lasting popularity of these poignant images of the self-respecting poor who turned their trades into performances. Even now, it is impossible to hear the cries of market traders and newspaper sellers without succumbing to their spell, as the last reverberations of a great cacophonous symphony echoing across time and through the streets of London. Surely none can resist the romance of the Cries of London and the raffish appeal of the liberty of vagabondage, of those who had no indenture or task master, and who travelled wide throughout the city, witnessing the spectacle of its streets, speaking with a wide variety of customers, and seeing life. In the densely-populated neighbourhoods, it was the itinerants’ cries that marked the times of day and announced the changing seasons of the year. Before the motorcar, their calls were a constant of street life in London. Before advertising, their songs were the jingles that announced of the latest, freshest produce or appealing gimcrack. Before radio, television and internet, they were the harbingers of news, and gossip, and novelty ballads. These itinerants had nothing but they had possession of the city. I write these words just a stone’s throw from Brick Lane, where Lionel Begleiter grew up in a first floor flat on the corner of Princelet Street in the nineteen-thirties. Although I do not know on which corner he lived, there is one building with a small window where I can imagine Lionel, as a little boy, leaning out to wonder at the Cries in Brick Lane. For, as ‘Lionel Bart’ in 1960, he wrote Oliver!, the only enduring theatrical dramatisation of Charles Dickens’ work, integrating both music hall and folk song into the stage musical with spectacular success. His setting of Cries of London, as “Who will buy this wonderful morning?” remains the most evocative musical manifestation in the collective consciousness. I leave you with the words of most celebrated Crier in our own century – Muhammad Shahid Nazir, the ‘One Pound Fish Man’ of Queen’s Market in Upton Park – as an example of the acclaim and status that Criers can win in London through their wit, ingenuity and performance skill. Nazir became an internet sensation with fourteen million views on Youtube, won a recording contract and is now a pop star in Pakistan. The Cries of London have taught me the essential truth of London street traders down through the centuries, and it is one that still holds today – they do not need your sympathy, they only want your respect, and your money. “In 1530 London’s population was around 50,000, yet by 1605 it had swelled nearly five times to 230,000 souls, becoming one of the largest cities in the world and a thriving hub of commerce and wealth. If you wanted to sell your stuff, then London was the place to do it. But most people could not afford a shop, so they sold their wares on the street and the way they attracted passing customers was to shout out – loudly – what it was they were offering. I am sure it will be a great evening. Via your blog, I have watched you conducting the research and compiling the drafts, notes, etc. I applaud your thoroughness and the touch of humanity and understanding you bring to the subject. “Who will buy, this wonderful his-try?” may well be another Cry of London! Enjoy your launch– and the compliments that will surely come to you.